This weekend should have been more productive. I guess there is still time. I was at work all day Friday. I didn't get any new assignments, so I spent some of my time working on homework. I also submitted my bookmark design and my web button design. I will post pictures of those tomorrow night. They are called Carbon Dioxide and You Can Change the World. 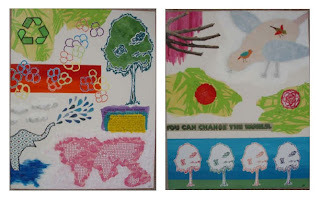 These are a combination of acrylic, paper cut-outs, gel medium, and thread on canvas. I will be spending the rest of the day making note cards for art history, finishing posters for graphic design, weaving baskets for fibers, and reading for statistics. Wish me luck and concentration.